I am not sure how I chanced upon this book. It wasn't as if I had heard about it from someone who'd read it. But I remember getting intrigued by the title on Amazon and then having it delivered to the Kindle app on my iPad. I did not know anything about the Kashmiri Pandit exodus until now. I kept hearing the word 'Pandit' during television debates around the Jammu and Kashmir elections. I had no idea of the brutality and the horrors faced by this community since India's independence. Hundreds of thousands of Kashmiri Pandits have migrated out of their original homes in the valley to Jammu and elsewhere. Many of those who decided to stay back have been murdered in cold blood. The first set of massacres happened just after Indian Independence when tribesmen from Pakistan's NWFP helped by Pakistani Army regulars stormed the region. The second set happened in the 1990s when the Mujahideen, egged on by Pakistan and with a lot of help from the locals disenchanted with the Indian political class, infiltrated into the valley and unleashed an equally destructive wave of terror. The book is a poignant chronicling of both these periods - the latter by the author, Rahul Pandita himself and the former by an uncle, paraphrased by the author. We see the Kashmir conflict through the eyes of a young Hindu boy who was brought up in the valley, whose life is shattered by marauding gunmen out to destroy society as he knows it. His father's painful decision of leaving a home ('that had twenty-two rooms') built with his Provident Fund savings after enduring nights of terror mentally destroys the family. From there, it is one struggle after another. The brutality is recounted in gory detail. Incidents of the people being shot at, women being raped and neighbours not helping in their hour of need leave the reader with a deep sense of anguish at the series of events that have rocked this beautiful land of Kashmir. What the author laments is that the story of the Pandits has not been told truthfully. 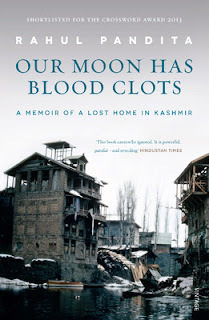 "Over the years, the narrative of what led to the exodus of the Kashmiri Pandits from the Valley has been changed. A series of untruths have been spoken so many times that they have almost become the truth. One major untruth is that the Pandits were made to leave Kashmir under a government design to discredit the Kashmiri secessionist movement." The truth however is that the Kashmiri secessionist movement was, in reality, the cause of the Pandit exodus. The Governor of the state, Jagmohan did not, unlike what many would have us believe, get the Pandits to leave wilfully to discredit the movement. Every conflict has multiple dimensions and more than one point of view. While Pandita's book gives us the story of the Kashmir conflict through the eyes of the Pandits, a recent film, 'Haider', directed by that genius of a film director, Vishal Bharadwaj, narrates the Kashmir conflict through the eyes of a Kashmiri Muslim whose father is falsely implicated by the Indian Armed Forces for terrorism. "Kashmir is so beautiful ..... even the gods are jealous of it", says Pandita in the book. "... And then they gave us rulers susceptible to greed, lust and deceit. And savagery." What better explanation can you give to such a beautiful land going through so much bloodshed? If you do not know much about the history of Kashmir, you must read this book and watch the film. Both are unmissable!